1. Click the + button at the top-left of the window. A new form will be created with a default field and the Form Inspector panel will display on the right of the window. 2. Select an icon for your form and give your form an appropriate name that represents the content you will be storing. You can set a variety of form level properties such as the Category your form will be located in, what the First Sort Field, Second Sort Field, Third Sort Field, and Group Records By fields will be. You can choose the sort direction too by clicking on the up or down arrows next to the sort field popup buttons. If you have any Number, Rating, Checkmark, or Calculation fields in your form, you can use the Calculation Field and Calculation Type to tell Tap Forms to compute the total, minimum, maximum, or average of the field that you selected. The results will be displayed at the bottom of the single-column records list view. Single Column List View Fields is used to tell Tap Forms how many fields to display on the single-column records list view. You can tell Tap Forms to display the first 1, 2, 3, 4, or 5 fields on the single-column records list view. If the first field is a Photo field type, then up to 6 fields can be displayed because the Photo field counts as one field but then you still have 5 additional fields you can display next to the Photo field thumbnail. 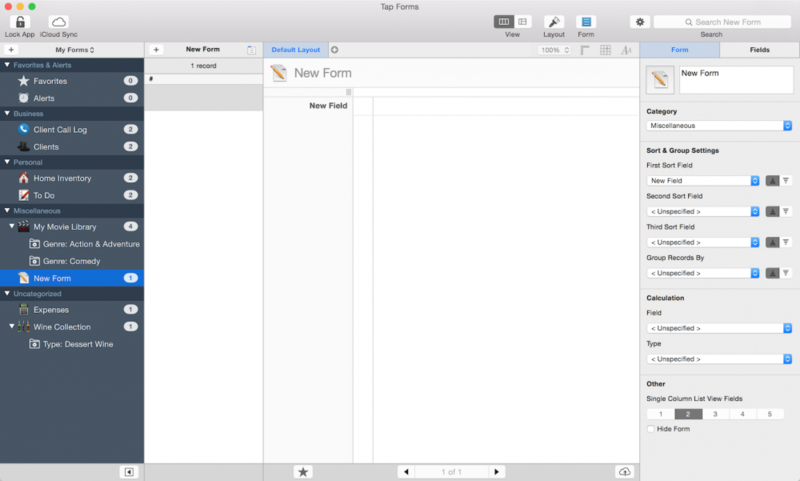 Hide Form tells Tap Forms not to display the form on the “My Forms” list even if there are records within the form. Normally the “My Forms” list will display forms that have 1 or more records within them. The form will still be visible in the “All Forms” list. The “All Forms” list displays all forms no matter how many records are in them. 3. Click the Fields tab and add some fields by clicking the + button below the fields list. Type in a title for your field and then select a field type. !If you change a field type from one type to another, you may see a warning message appear. Tap Forms will do its best to convert data from one type to another, but this is not always possible. Be sure you want to do this or the data in the selected field will be removed. For example, you can switch between Text, Note, Website, Email, but you can’t switch between Number and Photo, etc. without the data in the field being removed. As you add new fields, Tap Forms will display the properties inspector for each field type you add down below. Here you can set different field properties such as the field name, field type, number formatter, decimal places, default value, etc. Each field type has its own unique set of properties you can change. You can also rearrange the order of fields by dragging them up and down in the fields list. By rearranging the order of fields, Tap Forms will display them in whatever order you’ve set on the Default Layout and on the Multi-column List View. You can also delete fields by clicking the delete button next to the add field button. There is also a duplicate field button which will duplicate the selected field. *If you drag a Photo field to the first position in your form, Tap Forms will display the thumbnail of the photo to the left of the next set of fields on the single-column list view. You can control the size of the thumbnail on the Photo properties view.